Here is one of my favorite crank sets. This one is on a bike we recently acquired. it is the model 57 SC (also called the 57 Super Competition) and was introduced in 1957, hence the name. It has a BCD of 122mm. It also incorporates a distinctive “star” pattern shaped spyder, however said spyder was now cast as part of the drive arm itself, forged as a single unit. 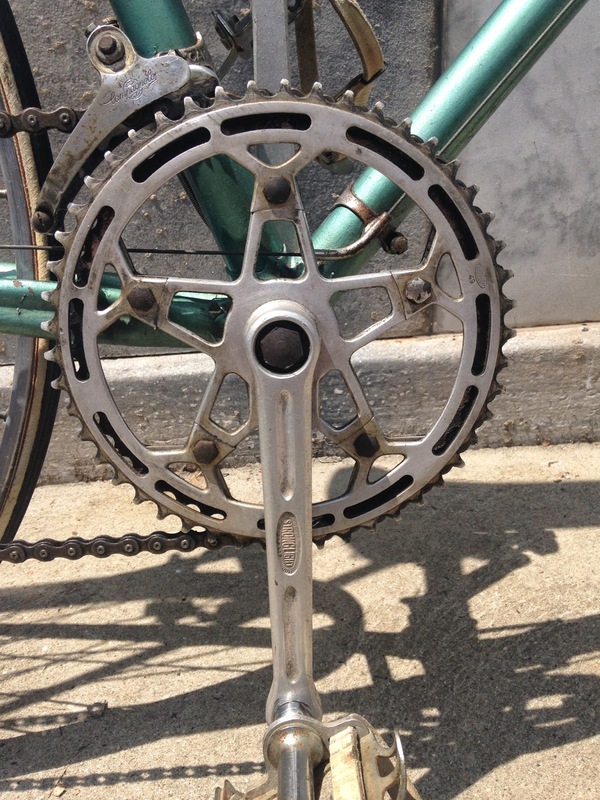 It uses 8mm chain ring bolts with either domed or hex heads as opposed to later 10mm allen head chain ring bolts. They were available in 165- 175mm arm lengths and were intended for road / race use with an effective chain ring capacity of 38-56 teeth, almost exclusively set up as a double. These cranks just look AWESOME! I am glad we now have another set!